The Economy Seated Class is better than the old 3rd class and is very similar to bus travel. This is definitely the cheapest way to travel around in South Africa. A ticket from Johannesburg to Cape Town is only about R425pp. 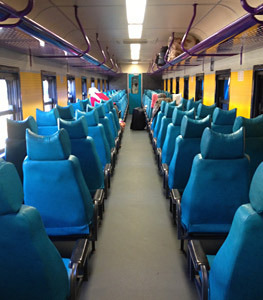 These long distance sitter trains travel up to four times per week on various train routes throughout South Africa, but need to be booked well in advance. Facilities on-board are basic, but there are toilets and wash basins on each end of the coach servicing the +/-70 passengers per coach. Unfortunately we can only help with groups of 5 or more.